In-Win must have been on to something when they came out with the original D-Frame. With similar design queues to the Ducati Monster motorcycle, the tubular chassis design was definitely unique. Although the original D-Frame was a limited production run (of only 500), In-Win brought the design to retail (non-limited production) in the D-Frame Mini. Sporting the same general shape, layout, and tubular chassis structure, the Mini ITX D-Frame Mini easily shares the roots of the D-Frame. The tubes are aluminum and welded together, and the side panels are tempered glass. The chassis can be set in any direction, with rubber bumpers on all sides. Retail price (Newegg.com) at the time of review is $349.99. There are three (3) color options. The same two that the original D-Frame was offered in, Red with black bumpers, and Orange with blue bumpers, and the addition of a Black frame with red bumpers (in this review). Great job on the review and build. I watched and read the comments on fb & YT, and your build made fans out of a lot of people who didn’t like the D-frame at first. 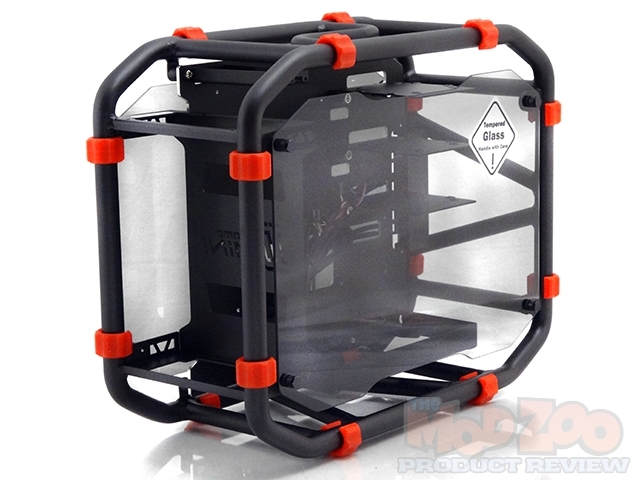 Nice review Mos, InWIn brings its A game on these cases. Looks to be a nice tidy fit with a water cooled system installed. Sweet review. It’s good to see someone doing WC fitting in these. Now, Mod the Bejezus out of it. I have yet to see anyone cut one. Nice review Chris. These cases are very interesting.